A Laurence Olivier Award winner for Best New Comedy in 1988 and Tony Award© nominee for Best Play. This one-woman show is filled with gems of wisdom, a good dose of laughter and a lot of poignancy. The story follows a middle-aged Liverpool housewife who finds herself in the rut of her dull daily life and in a loveless relationship. When her best friend wins a trip for two to Greece, she packs her bags, leaves a note on the kitchen table, and sets off on a “Mamma Mia” style adventure in search of her own life and soul. 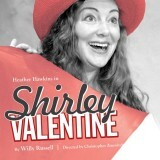 Heather Hawkins will return to ArtsWest to play the title role. Appropriate for ages 14+. Produced with special arrangement with Samuel French Play Services Inc.